There are many watch bands available for Apple's iPod nano 6G with more and more coming out each day. The minute Steve Jobs announced the iPod nano 6G and showed off its clock feature, companies took advantage to transform the iPod nano 6G into a Multi-Touch wrist watch. A design company called Minimal set out to do what no other company thought about and created a one-of-a-kind watch conversion kit for the iPod nano 6G crafted from the best materials. We've got the full review of Minimal's LunaTik right after the break. This is probably the best looking watch band available for the iPod nano 6G. 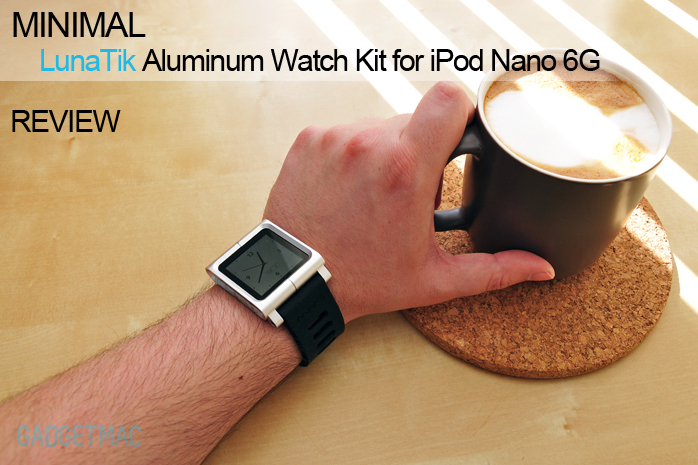 Those of you who are looking to use your iPod nano 6G as a Multi-Touch watch can look no further. The LunaTik has a CNC aluminum frame which encloses the nano 6G inside and a silicone rubber wrist band with stainless steel hardware. The silicone rubber band feels soft and very durable. It reminds me of a diving watch even though you cannot go near water with your nano 6G. I really love the look and feel of the LunaTik and it fits well on my wrist. The LunaTik is perfect if you like watches with a bigger than normal diameter like myself. I don't think the look of the LunaTik is geeky but actually manly enough to wear everyday. It's certainly very comfortable to wear each day and if you're familiar with G-Shock watches, the LunaTik is just as comfortable to wear. The only con I have with the silicone rubber band is that it tends to attract lint and dust. If you like the look of the matte aluminum finish that the LunaTik has then I see no reason why the LunaTik wouldn't make the perfect iPod nano 6G watch. I think that the LunaTik is on par with Apple's quality and that makes for one perfect accessory for the nano 6G. The side buttons of the nano 6G are easily reachable and you even can attach your headphones or in-ears to listen to your music or radio. I do think you should strictly use the LunaTik as a watch with the nano 6G. You can easily set the LunaTik to fit your wrist tightly and neatly attach the excess of the band using the little metal knob which can be repositioned. Installation is quick and easy, and is made by using the two hex tools included to remove two hex screws and slide the nano 6G into the LunaTik. The inside has two little pads that should help reduce scratching if any. The back clip of the iPod nano 6G fully shows thru the back of the LunaTik and also helps reduce the overall weight. I do wish that Minimal included extra hex screws with the LunaTik. I couldn't recommend a better watch band for the iPod nano 6G that really transforms the nano 6G into an elegant looking everyday watch. Even if you don't already own a nano 6G, this is the accessory that will make you want to go out and buy an iPod nano 6G just so you can use it as a Multi-Touch watch. Quality and beauty meets practicality. The LunaTik is available for $69.95.